For those of us who enjoy bodybuilding, powerlifting or any type of weight lifting, it’s important to keep blood pressure in check. Slinging iron around in the weight room causes acute increases in blood pressure while you’re training. It might be a distant afterthought but for those of us who enjoy getting our pump on, it’s imperative for our health and lifting longevity. I wanted to find an upper arm blood pressure monitor that didn’t have the hassle of wires and cables. Something that I could potentially throw in my bag if needed. It was also important I could just monitor my stats and didn’t need to make a written note of the results each time. 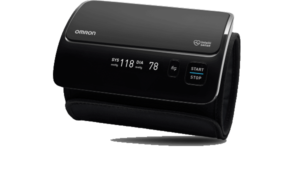 With almost impeccable timing, Omron got in touch with me about trying their new Evolv Bluetooth Wireless Upper Arm Blood Pressure Monitor. This is one of a plethora of new blood pressure monitors that have become more popular in recent years. They can sync with your smartphone via Bluetooth and a special app and allow you to monitor your blood pressure accurately without needing to take notes. As we age, our blood pressure rises naturally, so it’s vital that we monitor it to stay healthy. However, it is not always possible to get a doctor’s appointment every four weeks or at whatever regular period you’d prefer. Besides, who really wants to go to the doctor’s that often? That in itself can be a huge stressor and causes blood pressure to rise. The bigger issue then is monitoring your blood pressure regularly at home. Especially if you’re a regular lifter. How can it be done? Traditional home blood pressure monitors are clunky and feature numerous tubes and wires. In short, they’re a pain. Furthermore, according to the American Journal of Hypertension, they are, more often than not, inaccurate. The thing that stood out to me about the Omron Evolv Wireless Upper Arm device was the fact that it had a really slick and cool design. As noted earlier, another great feature was the lack of irritating wires and tubes. A nice little bonus is the fact that it also has a special detector for identifying when you have an irregular heartbeat. As it is incredibly easy to do, there’s no hassle doing weekly blood pressure checks. This allows me to closely monitor my personal fitness and achieve my various goals and stay in good health. I also use the device to keep track of my exercise routine, the impact it has on my blood pressure (both immediately and long term) and other metrics such as my salt intake, so I can adjust my diet if necessary. By far the biggest plus point is that I can get my BP checked more regularly than just when visiting a doctor for something unrelated. 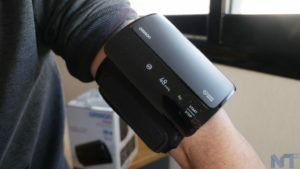 I had a look and found that usually wireless blood pressure monitor cuffs are around £50 all the way up to £300, which is much more than high quality variations of the more traditional kind of home-use monitors. I also found that not all of these modern wireless cuffs have screens, so you can only view readings using your smartphone which isn’t ideal. With the Omron Evolv though, you get a screen that is very easy to read and a monitor you use on your upper arm, so I found it to be fantastic value from Amazon or Boots (which, at the time of writing sell it for £97). You know you are getting an accurate device for a reasonable price with these features. The Omron Evolv has clearly been designed with the end user in mind. It is incredibly easy to fit onto your arm and is actually very comfortable, even while the blood pressure cuff does its thing (even for the bigger bicep’d lads). According to Omron the cuff supposedly eliminates any interference that could make the results of testing less accurate. You only need 4 x AAA batteries to operate it and when you are finished it can be stored away easily. Thanks to its incredibly portable design it’s very easy to pack away into your carry-on bag when you are travelling. The app functions well and enables me to keep track of fluctuations in my blood pressure digitally, so I never have to write anything down. It also just makes it easier to relay the results to my doctor, when necessary, without him or her trying to decipher my messy notes. As nice bonuses, it can be used with multiple users at the same time and will track their readings and keep them store and it can be integrated with Amazon’s Alexa. Although the actual app can hold more than one blood pressure reading, the cuff itself can’t. This means that all other users have to use their smartphones to keep track of their readings. Using it without the app is less convenient and it could benefit from being compatible not just with Alexa and Echo but, Google Home too. Only real negative I found, but wasn’t a deal breaker for me as I’ll be the main user. In summary, because this device is one complete unit and pretty slick and portable, it is a very easy and convenient way to monitor blood pressure. I highly recommend it to you, if like me, you are looking for something with very intuitive controls that make it easy to check your blood pressure, wherever you are. The Omron Evolv is a great choice too if you are looking for something that goes the extra mile and does more than just simply take readings. With the Omron Connect app, you can store an unlimited number of readings, monitor changes and trends and you can even share your results with members of your family or health professionals. The Omron Evolve Wireless Upper-Arm Blood Pressure Monitor is available right now from Amazon, Boots and Argos. I’d recommend this to any lifter or anybody interested in maintaining good health full stop. Full Disclosure: I was sent a blood pressure monitor by Omron, however, this review is my totally honest opinion with no guidance or influence from Omron whatsoever.